$144.8 - Just in time for the coming holiday season, this new fancy girls dress is a creation from high end designer Tutu Du Monde. This brand excels at bringing high fashion and ultra fem looks season after season. Your daughter will feel like she has stepped out of a fairy tale any time she wears this new dress perfectly named "wonderland". The soft tone silver is a classic holiday color and is perfect for all of your upcoming special occasions. The bodice has a natural waist with an off the shoulder neckline supported with thin straps. 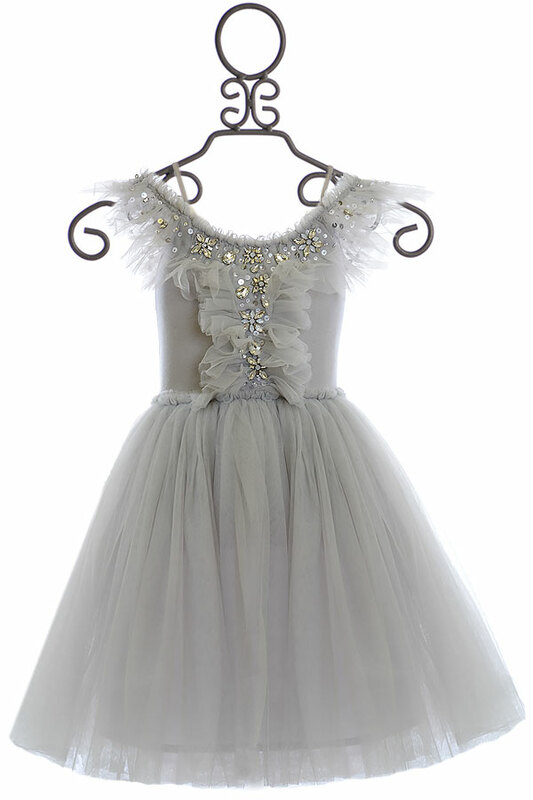 Ruffles of matching tulle decorate beautifully while dressed in shining gems. Her tutu skirt is created with sheer fabric that layers on the matching lining. Dry Clean only.